Over the past 16 years MAG have been involved in all aspects of the commercial laundry industry, starting as a service engineer in my early years. I have repaired them, installed them, owned my own launderettes & commercial laundries, moving through the system until eventually being a director of MAG Equipment Ltd. I had years of meeting and talking to shop owners all over the country, and from that I have compiled just a few thoughts and tips to help you on your way in successfully opening your new business. 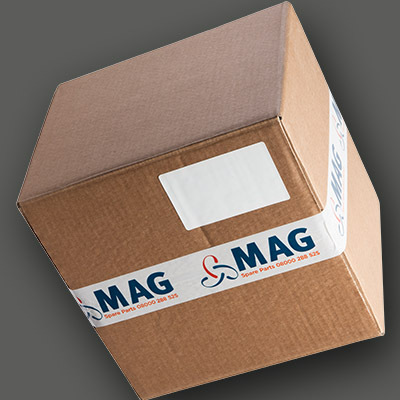 WE ALSO OFFER A FREE INFO PACK CALL MAG EQUIPMENT FREE 0800 028 8525. When looking for your premises you should try to make sure there is easy parking either outside or close by to your proposed site, allowing customers an easy drop off and collection point. Remember that all new proposed sites require planning permission from your local council. You should have a good social mix of council tenants and privately owned properties close by, even better if there is a large bed-sit area or college where students invariably reside. You will need to talk to your local suppliers of GAS / WATER and ELECTRIC,this is a very important part of the set-up as these are the 3 main running cost of your new business. A standard launderette would require a 2" gas main 1000,0000.btus but this will depend on the equipment you will be using (check specifications first). Although you can run most modern machines now on standard 1phase (single phase) you will have a much wider choice on equipment (if you decide to use reconditioned machines) most of these will be 3phase 415volts. Again check with your machine specifications and your local supplier. In a launderette set-up, as you may well imagine, one of the biggest supplies is water. This can be run into a water storage tank or tanks. Again, please check the machine's specification and remember that all washing machines are not the same. Ideally, on start up you should allow yourself extra space if possible, as this could be utilised if you find that at a later stage you need to expand the launderette, due to income generation. 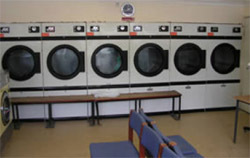 A basic size launderette would generally consist of between 6 to 8 washing machines and 6 to 8 tumble dryers. 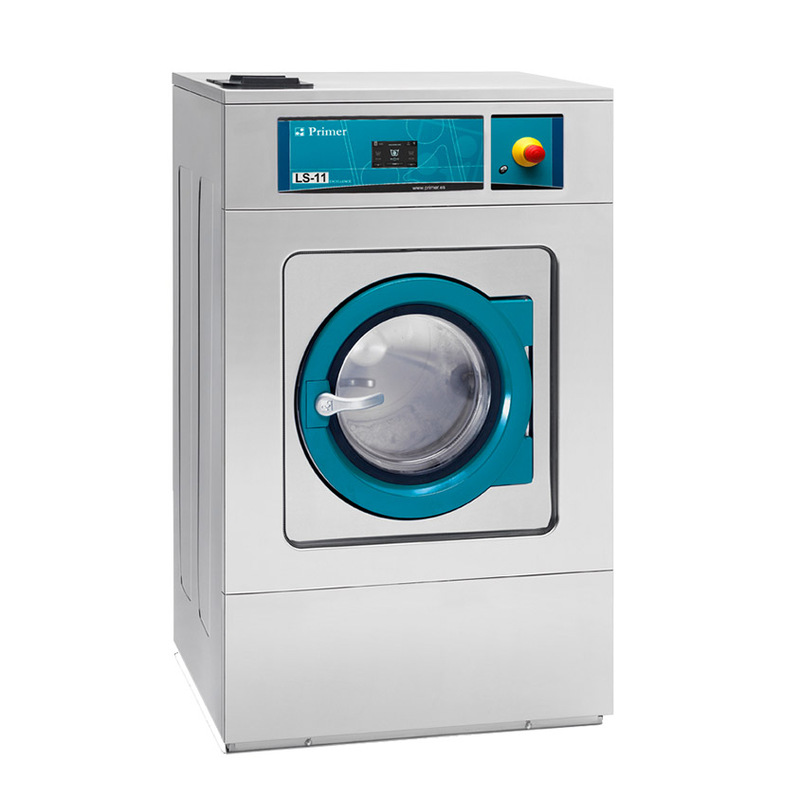 The washing machines being 7kg / 10kg for service washing & 16kg machine for larger loads and duvet processing. 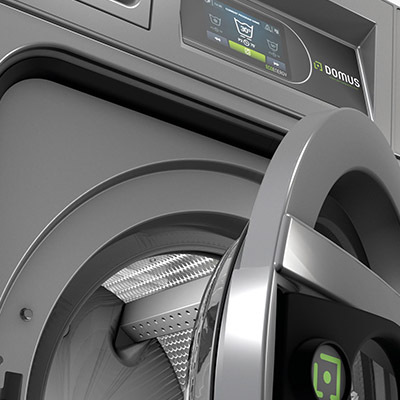 The dryers would be 30 to 35lb capacity (ideally gas heated) single pocket style and if space is a problem then stack dryers are available, with a 50lb dryer capacity to service the larger wash loads. One of the main parts of the laundrette which is not normally seen by the public is commonly known as the boiler room. This section will be the home to your water storage tank / boiler & pump. 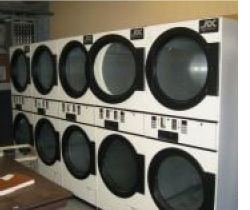 Older launderettes always seemed to have a tank that would supply 10 x launderettes to me. Water storage is around 300/500 gallons depending, again, on the style of machines but most modern shops now utilise the space and design and build a tank (preferably in stainless steel) in the space they decide this is not the cheapest way but by far the best long term. New equipment looks great in your new shop but make sure you don't stretch your budget. Always allow at least 3/5k for the unexpected bill or alterations you may need to implement. Used Equipment can be a real saver on your capital expenditure by sometimes up to 50%. Installation of the machines should be carried out by the professionals. DIY jobs can sometimes invalidate your warranty if the equipment is installed incorrectly. Ducting and ventilation work will need to be carried out for the dryers. Drainage for the washing machines. 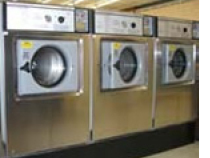 Most commercial washing machines & dryers are designed to run for 20 years plus. Drop Off & Pick-Up Service. Local Contracts i.e Hair Salons / Hotels / Restaurants / etc. Ironing Service (This is very popular with most income couples). Generally, water is pre-heated by your gas boiler and stored until required, stored externally to your washing machines this by far is the cheapest way. However, if space is a problem. 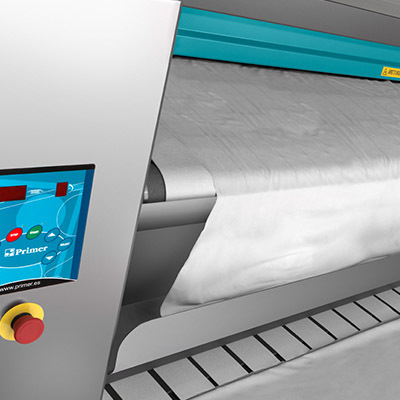 Machines are available with internal heaters. Dryers are invariably gas heated as the running costs of gas is 5 times less than of electric ones. Not forgetting the shop! After all the equipment and plant machinery is installed you will need to box in and secure all the machine and meet all health and safety guidelines. Sound a lot of work? 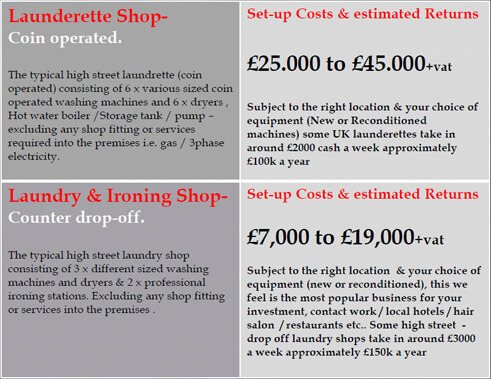 Launderettes are here to stay with at least one new shop opening every month in the UK. Whether you are an unmanned system or fully staffed catering for service washers and even ironing service, after all the hard work, the returns can be phenomenal. FOR MORE INFORMATION AND A FREE INFO PACK CALL MAG EQUIPMENT FREE 08000288525.